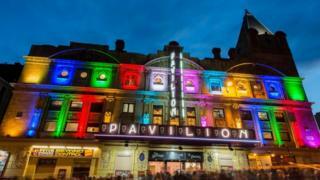 The Pavilion Theatre is due to host its first performance since a fire closed the historic building in March. A post on Facebook said the theatre team was "looking forward to seeing all the happy faces returning". The 114-year-old building was saved from the flames after a fire broke out at the nearby Victoria's nightclub in Sauchiehall Street. The rescheduled "Celtic The Musical" will run until 29 September. In a social media post, the team at the Pavilion said: "We made it and are all ready for tonight's reopening and the first performance of many to come. "It has been a long five months and we look forward to seeing all the happy faces returning to the Pavilion. "We would like to thank all the teams involved who have completed the refurbishment works in record-breaking time. "We would like to thank our staff who have kept up their spirits during this period, and welcome new staff about to start with us. "It was great throughout this whole period to receive the support and kind words from all our customers, not only from the west of Scotland, but throughout the world. It is amazing the memories that the Pavilion has brought to a lot of people's lives." The fire on Sauchiehall Street in March was followed by another blaze at the Glasgow School of Art's Mack Building, further up the street, in June.